← Purity in the name of Religion. The art scene in Bombay is flourishing – earlier art galleries were limited to the Kala Ghoda area or the arts district. In the recent past contemporary galleries have opened up in the Fort area and a gallery dedicated solely to photography called the Matthieu Foss Gallery has opened up at Ballard Estate in Colaba. 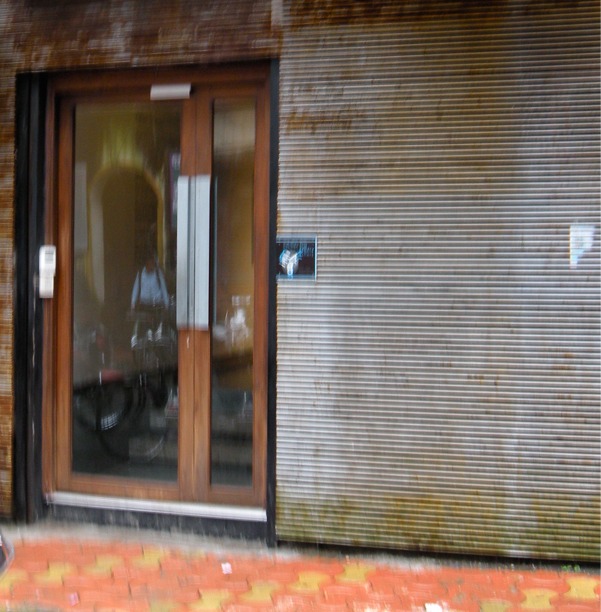 Matthieu Foss Gallery entrance on Goa St. The gallery is designed to be an open space and can easily adapt to the various artist’s needs. As one steps in to the gallery one faces a wall with a cleverly designed screen like window that has sharp angles providing a glimpse of the main space. Visitors are then greeted by a friendly gallery attendant that tries to answer any questions you have and make sure that you are comfortable. As one turns the corner – the main space is revealed and the work unfolds. In the past the gallery has hosted artists like Anne Maniglier, Shahid Datawala, Sanjeev Khandekar and Ashvin Mehta to name a few. At present the gallery is featuring a fashion photographer – Fabien Charuau’s work entitled ‘The Great Unwashed & Stumble Asleep.’ ‘The Great Unwashed,’ is an homage to the Indian male bodies and it captures the body language, behaviour and the clothing of these masses. In ‘Stumble Asleep’ the second series of the show the artist tries to capture vivid images trying to depict the dreams of most Indians in the city as they sleep, sometimes soundly even in uncomfortable surroundings. The prints in ‘The Great Unwashed,’ capture the masculine sensuality of Indian men as they go about their daily lives and routines. In ‘Stumble Asleep,’ Charuau depicts happiness and darkness as some prints have dark shadows and some that fade away. The subjects of these prints are people who make up a majority of the Indian population that exist in pockets throughout the country. The artist manages very well to capture the moments from their daily lives and tell stories of these Indians – not a picture that India today would like to portray. This entry was posted in Culture, Design, Fashion, Travel and tagged art, Bombay, Culture, Fashion, gallery, Mumbai, Photography, Travel. Bookmark the permalink.